Is the HTC One a smartphone that takes pictures or a camera that makes phone calls? That question may sound facetious, but there's the buzz around the upcoming HTC One and its newfangled UltraPixel camera—which will land in consumer hands on April 19th. The HTC One’s major selling point is its camera, which uses the beefy processing power of its 1.7GHz Qualcomm Snapdragon quad-core processor in conjunction with HTC's custom imaging chip. It promises higher quality still images and video than its smartphone competitors and a superior photographic experience compared with most dedicated point and shoots. The HTC One camera touts richer images in low light—without flash—reduced motion blur, and minimal compression. HTC says this is achieved with the company’s new UltraPixel sensor, combined with optical image stabilization, swift shutter speed, and a wide f/2.0 aperture. 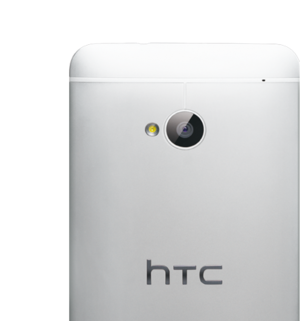 Yet, despite the UltraPixel terminology, the HTC One actually features a 4-megapixel sensor with the same physical dimensions as its current HTC One X's 8-megapixel camera. The difference is that each individual pixel on the sensor is larger and captures more light. “The UltraPixel is a pretty straightforward principle. We wanted to put the biggest possible individual pixel we could so it can absorb more light without creating more noise,” Whitehorn says. HTC also stuck with the One X's aperture size of f/2.0—which compares with the Samsung Galaxy S4's f/2.2, the iPhone 5's f/2.4, and the Samsung Galaxy S III's f/2.6. HTC claims the aperture lets in 44 percent more light than the iPhone 5 and 69 percent more light than the Samsung Galaxy S III. The camera also includes optical image stabilization—unique for an Android phone. For video, you can record footage in 720p HD at 60 frames per second (fps) and in 1080p at 30fps. The UltraPixel concept is simple: fewer, larger pixels producing higher quality, less noisy shots—especially in low light. This improved image quality is helped by the HTC One's more advanced 1/3-inch CMOS sensor, ImageChip 2-optimized image signal processor, and optical lens system. Thus each pixel should capture over 300 percent more light than comparable 8- or 13-megapixel cameras such as the iPhone 5, Nokia Lumia 920, and Samsung Galaxy S III. This debunks the so-called "megapixel myth," which says that more megapixels equals a better image. "The old analogy that the industry uses is called pixel rain, so you can imagine photons coming down as rain—with photon rain being collected in buckets with the buckets being the pixel," says Whitehorn. "Now you could put a lot of little cups out and try to collect the same amount of rain and you wind up getting noise between the cups as opposed to it all falling into one big bucket." With UltraPixels being larger than ordinary pixels, fewer pixels take up more space on the sensor—buckets rather than cups. According to HTC, the 2.0 micrometer UltraPixel has twice the surface area of the 1.4 micrometer pixel found on typical 8-megapixel cameras and even more over the 1.1 micrometer pixel on 13-megapixel cameras. Thus photos from the HTC One should display greater color accuracy. It also means shooting with less flash. "You get really natural looking photos without using a flash," says Whitehorn. "We modulate the flash to be very subtle for good skin tones. People don’t want to use the flash, so it's not blowing out skin tones or the foreground." HTC spared some love for the front-facing camera too. "We’ve put some resources into that—we have a wider angle than is normal," said Whitehorn. "You can fit three people horizontally at arms length and there's a lot of correction going on for a natural looking wide angle shot." The company has installed a physical optical image stabilizer into the HTC One, technology already found in dedicated digital cameras, but not, thus far, in smartphone cameras. Says Whitehorn, "It's optical image stabilization because it’s physical—it’s physically moving the lens, we’re not manipulating the sensor.... It’s the only Android phone on the market that does that." The UltraPixel camera's marquee feature is HTC Zoe—derived from the Zoetrope concept of creating motion from a series of static shots. With Zoe engaged, you just tap the on-screen shutter and the camera automatically captures up to 20 still photos and a three-second video, tailor-made for social networking. You can also drag through the video to extract a still image from it. In Zoe Mode, you shoot both HD video and still images in burst mode simultaneously and the camera records both before and after the shutter tap. When you're done creating Zoes, you can share them with others on HTC's Flash-based Zoe Share Website, where they reside free of charge for six months. This sort of door-to-door service puts HTC in charge of the shooting and sharing sequence, allowing users more creative space to conceptualize in the moment. "I’ve been observing the convergence between still and video photography and that the distinction between the two is starting to erode," said Whitehorn. "At the same time people’s desire to not only share but to become publishers and broadcasters is growing, and the Zoe feature is really an amalgamation of those trends." Whereas Zoe captures three seconds of video and stills at the same time (and a brief interval before the shutter tap), the HTC One's highlight movie of 30 seconds is automatically stitched together based on all the video, images, and Zoes you shoot each day, set to HTC music. You can save highlight reels as MP4 files or share them via Facebook or e-mail. "You shoot Zoes, events, and videos and they all go into an amalgamation, and from that your highlight reviews are curated...It’s sort of like an Instagram for video," Whitehorn says. "What’s really nice is that it’s all done in real time. We found that one of the biggest pain points for people is that they can shoot video fine, but that they couldn’t do anything with it. Everyone seems to stall when they get to the conventional video editing software. So we throw the editing software out and do something for people—we’ll make it for them and they can refine it. That’s really the philosophy." Whether all of these fine camera attributes are compelling and how well they function, I’ll save for our review, which will be published Monday. This story, "HTC One debuts UltraPixel technology, but is the phone's camera all it's cracked up to be?" was originally published by TechHive. With its stellar design, great camera, and hardy processor, the HTC One is the phone to beat. Phone feels great in hand. Ultra-high resolution display looks amazing. Camera excels at taking low-light photos. Volume and power buttons can be hard to locate.